(Nanowerk News) If the promise of nanotechnology is to be fulfilled, nanoparticles will have to be able to make something of themselves. An important advance towards this goal has been achieved by researchers with the U.S. Department of Energy’s Lawrence Berkeley National Laboratory (Berkeley Lab) who have found a simple and yet powerfully robust way to induce nanoparticles to assemble themselves into complex arrays. By adding specific types of small molecules to mixtures of nanoparticles and polymers, the researchers are able to direct the self-assembly of the nanoparticles into arrays of one, two and even three dimensions with no chemical modification of either the nanoparticles or the block copolymers. In addition, the application of external stimuli, such as light and/or heat, can be used to further direct the assemblies of nanoparticles for even finer and more complex structural details. 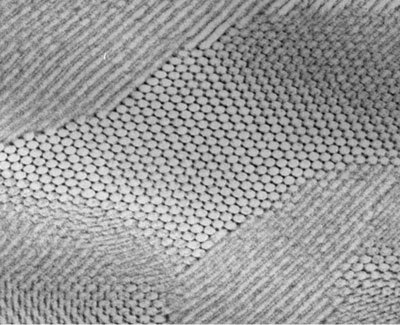 This electron micrograph shows a self-assembled composite in which nanoparticles of lead sulfide have arranged themselves in a hexagonal grid. Xu is the corresponding author on a paper describing this work that has been published by the journal Nature Materials. The paper is titled: “Small molecule-directed nanoparticle assembly towards stimuli-responsive nanocomposites.” Co-authoring this paper with her were Yue Zhao, Kari Thorkelsson, Alexander Mastroianni, Thomas Schilling, Joseph Luther, Benjamin Rancatore, Kazuyuki Matsunaga, Hiroshi Jinnai, Yue Wu, Daniel Poulsen, Jean Fréchet and Paul Alivisatos. Nano-sized particles - bits of matter a few billionths of a meter in size, or more than a hundred times smaller than the stuff of today’s microtechnologies - display highly coveted properties not found in macroscopic materials, including optical, electronic, magnetic, etc. The promise of nanotechnololgy is that exploiting these unique properties on a commercial scale could yield such “game-changers” as sustainable, clean and cheap energy, and the creation on demand of new materials with properties tailored to meet specific needs. Realizing this promise starts with nanoparticles being able to organize themselves into complex structures and hierarchical patterns, similar to what nature routinely accomplishes with proteins. Small as they are, nanoparticles are essentially all surface so any process that modifies the surface of a nanoparticle can profoundly change the properties of that particle. Precisely arranging these nanoparticles is critical to tailoring the macroscopic properties during nanoparticle assembly. Although DNA has been used to induce self-assembly of nanoparticles with a high degree of precision, this approach only works well for organized arrays that are limited in size; it is impractical for large-scale fabrication. Xu believes a better approach is to use block copolymers - long sequences or “blocks” of one type of monomer molecule bound to blocks of another type of monomer molecule. Xu and her group found such a “mediator” in the form of small molecules that will join with nanoparticles and then able attach themselves and their nanoparticle partners to the surface of a block copolymer. For this study, Xu and her group used two different types of small molecules, surfactants (wetting agents) dubbed “PDP” and “OPAP.” These small molecules can be stimulated by light (PDP) or heat (OPAP) to sever their connection to the surface of a block copolymer and be repositioned to another location along the polymeric chain. In this manner, the spatial distribution of the small molecule mediators and their nanoparticle partners can be precisely directed with no need to modify either the nanoparticles or the polymers. For this study, Xu and her colleagues added PDP or OPAP small molecules to various blends of nanoparticles, such as cadmium selenide and lead sulfide, mixed in with a commercial block copolymer - polystyrene-block-poly (4-vinyl pyridine). While she and her group worked with light and heat, she says other stimuli, such as pH, could also be used to reposition small molecules and their nanoparticle partners along block copolymer formations. Strategic substitutions of different types of stimulus-responsive small molecules could serve as a mechanism for structural fine-tuning or for incorporating specific functional properties into nanocomposites. Xu and her colleagues are now in the process of adding functionality to their self-assembly technique. This research was supported in part by the U.S. Department of Energy’s Office of Science and in part by the Army Research Office and National Science Foundation. The nanoparticles were synthesized at Berkley Lab’s Molecular Foundry and characterizations of the nanoparticle assemblies were performed at Beamline 7.3.3 of Berkeley Lab’s Advanced Light Source. Both the Molecular Foundry and the Advanced Light Source are DOE Office of Science national user facilities.